As a web developer, I have a lot of browsers and browser windows open all the time, and I often login to various sites (locally and remotely) with various default settings stored in my cookies. Sometimes, though, I don't want to be logged in to a site, or I don't want any settings read from my cookies. In the dark days, I would deal with this by just opening different browsers: if I use IE most of the time, then I'd use Firefox to access the site with a "clean" set of cookies (or lack thereof). Or, when Incognito Mode came along, I would just use that (I often still do). However, I don't have to do this anymore. There are a variety of tools out there to examine and manipulate browser cookies. One that I've been using for a few months now and I rather like is a Google Chrome extension called Edit This Cookie. 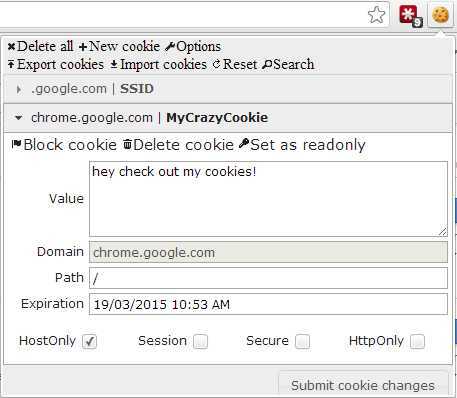 It adds a little cookie button to Chrome that allows you to examine, delete, edit cookies.